Ever look at a photo of yourself from only a few years ago and ask yourself, “Huh, were my teeth looked a bit brighter back then?” We definitely do. 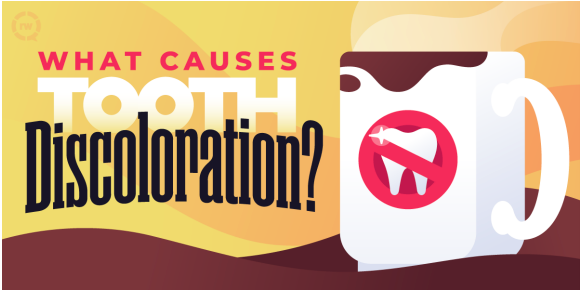 Coffee and red wine usually get the blame for teeth discoloration, but several other causes may be the culprit. We’re definitely a little biased at the office of Mary E. Peebles-Turner, DDS. But if you don’t brush and floss regularly, plaque can harden into tartar, leaving a yellow-brown color along your gums. Some of the foods we hold dearest to our heart, like coffee on a Monday morning — can stain our teeth. Besides coffee and red wine, a few of the top offenders include teas, berries, grapes, tomato and soy sauces, soda, and dark juices. Smoking and chewing tobacco can cause a slew of health issues, the least worrisome of which is yellow teeth. That said, it’s one of the most common aesthetic complaints among tobacco users. Enamel is that hard shell that protects the inside of your tooth. But if it decays or doesn’t fully develop, you may see a variety of stains and changes, including pits, white spots, or yellow-brown streaks. If you suspect decay, schedule an appointment with us as soon as possible. If you need some help adding more sparkle to your smile, we’re here for you, too. We offer whitening services like home whitening treatments. Give us a call to learn more or to schedule your appointment at 303-460-9366. The office of Mary E. PeeblesTurner, DDS serves the neighborhoods of Broomfield, Thornton, Westminster, Louisville and Superior in Colorado. Please visit our website at www.broomfielddentist.com. https://broomfielddentist.com/wp-content/uploads/sites/23/2019/02/Screen-Shot-2019-02-06-at-2.37.38-PM.png 292 582 Administrator https://broomfielddental.onestopclients.com/wp-content/uploads/sites/23/2017/04/Broomfield-Dental-Logo.jpg Administrator2019-02-06 19:39:012019-02-06 19:39:01What Causes Tooth Discoloration?